More and more people ask us about the Turda salt mine. What is there? We heard is an amusement park … underground??? 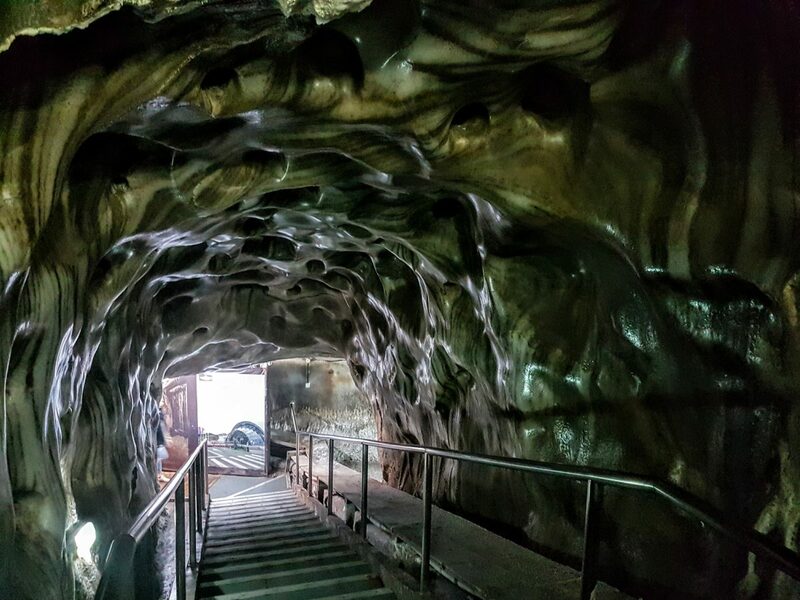 Why would they make an amusement park underground in a salt mine? It all started somewhere in the 1200’s when the first documents talk about the salt exploitation in Turda. Back then salt was prime resource, and it was worth it’s weight in gold. Salt mining was done entirely manual, and it was one of the most dangerous jobs. The salt was cut into big blocks from the floor of the mine, then transported vertically to the surface using a horse powered elevator. The mines have a bell shape 90 meters high, with a diameter of about 4 meters on the top and 87 meters wide at the bottom. Shaped like this the mine walls were stable and was less prone to collapse. Mining stopped here in 1930, when you were and more productive mines were opened in other regions of Transylvania. 1950 the mine was open as a tourist attraction, then between 2008 and 2010 the mine went through a serious renovation to be opened again for public in 2010. In Romania there is a strong belief that the salty air in the salt mines has beneficial effects on health, especially onrespiratory conditions. That’s why a lot of Romanians go to the salt mines for a salty air cure. In Turda salt mine, there is a even a spa area where people go for the salty air treatments. People want to spend a day or two in inhaling ionized salty air inside the mind. So for these people, who spend the whole day in the mine, there are a couple of entertainment facilities down there including a Ferris wheel, pool tables, minigolf, a small amphitheater and even some boats on the small lake at the bottom of the bell shaped mine. 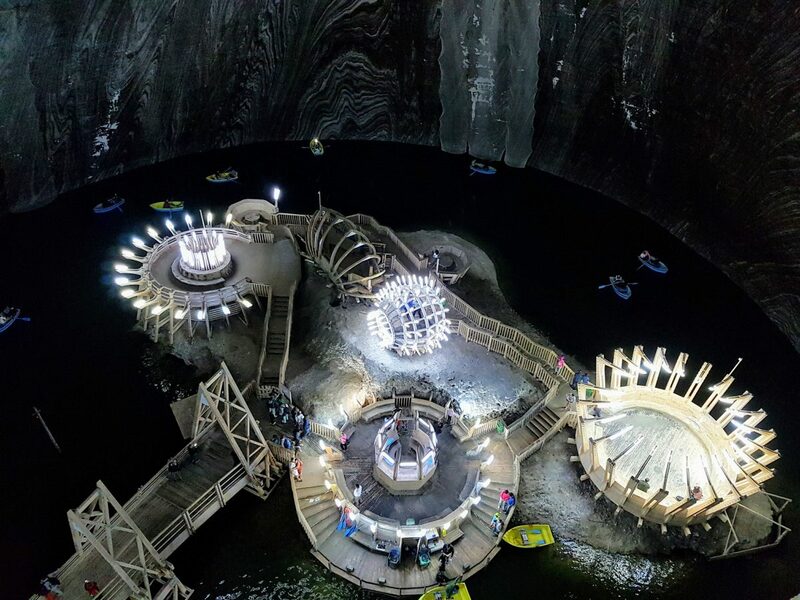 That’s why the amusement park is not the primary reason why people go to Turda salt mine, but since people spend a lot of time in the mine they needed some activities to kill the time. For the tourist the main attraction is the amazing site of the mine. Down there it feels like out of this world. The sheer size of the mind is just impressive. One of the bell shaped mines is 90 meters high, with glossy black salt walls, and amazing patterns created by various layers of colored salt. The lighting in the salt mine adds to this atmosphere. Rows of neon tubes hanging from the ceiling, combined with the mesmerizing salt patterns in the walls, would make you think you are in a science-fiction movie set. You feel like an ant down there, so small compared to everything that surrounds you. 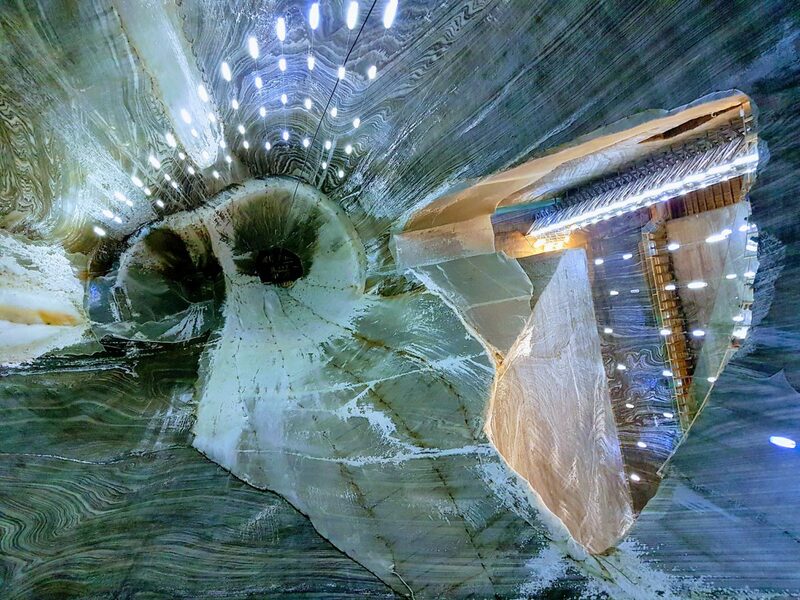 Turda salt mine is located 30 km south of Cluj Napoca, in the middle of Transylvania. Is about 6 hours driving from Bucharest but you can fly to Cluj Napoca and drive from there 45 minutes. Alternatively you can join our complete tour of Romania which includes a visit to the salt mine, or request a custom tour to include it. Make sure you have at least four days for this, since it would be a shame not to see the rest of the things that are on the way. If you visit Romania for a couple of days and you have some spare time I would strongly recommend going to Turda salt mine. The words are not enough to describe the experience of visiting this place. Entrance fee is 20 lei per person.